Idaho is staffing 14 roadside stations inspecting boats for invasive species this year and major highway corridors into the state. The Oldtown inspection station on Highway 2 east of Newport was the busiest in the state in 2012 with 6,056 inspections followed closely by the two Interstate 90 check stations – Huetter for eastbound traffic and Cedars for westbound vessels. The Cedars check station near Fourth of July Pass caught 16 fouled boats in 2012, the most in the state. 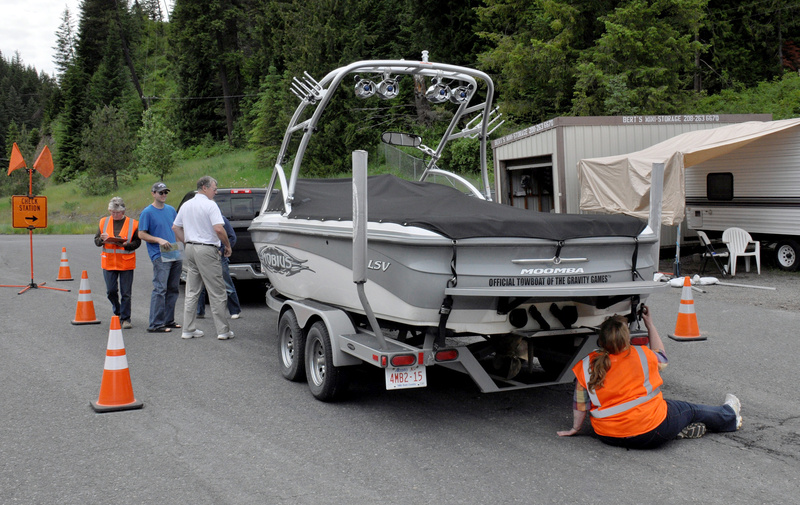 In 2012, Idaho check stations conducted 42,348 inspections and found 57 boats contaminated with quagga or zebra mussels. In 2011, inspectors found 24 fouled boats in 47,027 inspections. This year, 10 fouled boats had been found in 16,322 inspections through Monday. • Idaho Invasive Species Hotline: (877) 336-8676. Idaho’s 14 roadside boat inspection stations are busy trying to keep the state’s waters from being infested by nasty invasive species. Boaters are required to stop at the stations, two of which are in the Panhandle along Interstate 90 near Post Falls and near Fourth of July Pass, as well as one in Oldtown. Should quagga or zebra mussels take hold in Idaho’s lakes and rivers, the state could face expenses in the neighborhood of $100 million a year to keep them from fouling everything from boat motors and facilities to irrigation and municipal water systems. Quagga mussels, which range in size from microscopic to the size of a fingernail when full grown, are prolific breeders and attach themselves to hard and soft surfaces. State officials say they can’t afford to let these exotic threats get a foothold in the state as they have in the Great Lakes region as well as in western states such as Nevada, Arizona and California. Idaho is one of only five Western states where quagga mussels have not been introduced. State officials want to keep it that way. “Idaho was a leader in the program, but now Montana, Wyoming, Oregon and Washington to a point are becoming invested in keeping the mussels out of our waters,” said Matt Voile, Idaho’s coordinator for invasive species and noxious weeds programs. Washington does not have an active boat inspection system in Eastern Washington except for boats that might be checked at weigh stations. Montana and Wyoming are doing random checks at boat launches. Idaho’s boat inspection program is funded with nearly $1 million a year from sales of the invasive species stickers required on boats used in state waters. All registered boats launching in state waters must display a sticker, as well as any nonmotorized vessels, such as drift boats, kayaks and rafts. Exempt from the requirement are inflatable nonmotorized vessels less than 10 feet in length. Oregon enacted a mandatory sticker program last year and is doing roadside checks and some random boat launch checks. Fouled boats are decontaminated with 140-degree water before being released. Idaho’s check stations are low-key, with a thorough check for first-time boats and quick subsequent checks for boats that go back and forth to local waters. Boat owners who drive past a check station without stopping risk a citation from state patrol or sheriff’s deputies, Voile said. The Cedars check station on the east side of Fourth of July Pass opened in February, the first of Idaho’s stations this year. It’s scheduled to be open well into September.